In this post, we are going to go over troubleshooting our VPN using debug commands. This is particularly useful for the folks out there reading this that only have access to only one side of the VPN or have a VPN to a 3rd party. I wanted this to remain a separate post from my ASA and IOS site-to-site VPN configuration posts because troubleshooting this is almost entirely identity on both a router or an ASA so I wanted to combine the troubleshooting to a single post. I'm going to start with the debug crypto isakmp command and walk through a successful ISAKMP SA creation. This is after I issue the clear crypto session command and ping a host from one side to the other side. Then MM#3 and #4 are processed as part of the Diffie-Hellman exchange and if you'll notice from the highlighted portion, NAT-T did it's job in detecting that there was no NAT between peers. Phase 1 has now completed and Phase 2 will begin. The output will let you know that Quick Mode is starting. 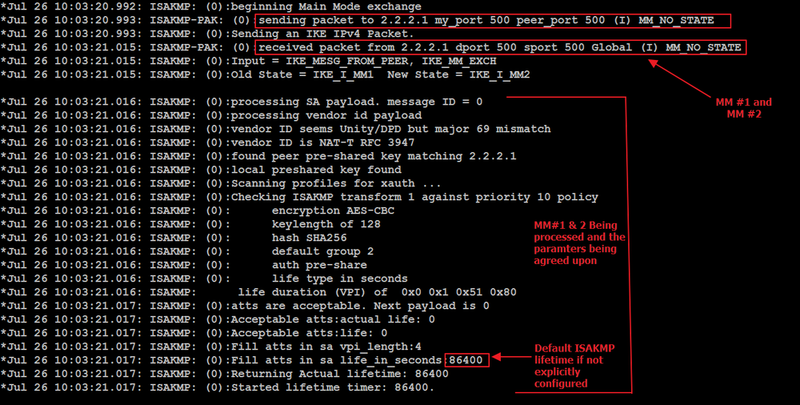 You can see the first Quick Mode message sent from the initiator with the IPSec proposals (crypto ipsec transform-set tset esp-aes 256 esp-sha512-hmac). The peer will send back a reply with chosen proposal and the Proxy ID. The initiator will then send the final Quick Mode message as a final acknowledgement. At this point, the debug output will indicate that Phase 2 has completed. Makes sense, right? Since the name of this post has "troubleshooting" in it, let's break some stuff to see what it looks like. Note: When troubleshooting site-to-site VPNs, there's always a side that sends the first packet. This process is started by the first side that needs to send traffic to the other side. This peer is referred to as the initiator. The responder always gets a bit more detail in regards to what is going wrong during the IKE process. If you need to troubleshoot why a VPN won't come up, a good exercise might be to clear the crypto session and then let the other side initiate the traffic if you find yourself the initiator. For educational purposes, I'm going to walk you through what it looks like when VPN failing from both sides. For this section, I'm going to make some changes to the ISAKMP policy on the remote peer and clear the crypto session by issuing the clear crypto session command. When we do the debug after we clear the session, the changes I made should be reflected. If this is all you can see and you can't get the other side to troubleshoot it with you or have them initiate traffic so you can view the output as a responder, then I would have the other side verify the above. If your side is the responder, then let's dig into what it looks like for the conditions it could be. Now let's take a look at what happens when the ISAKMP policy is matching and the ISAKMP peers are defined but the pre-shared keys are wrong. From the initator side, everything will look correct until you get to MM#5 where the peers are authenticating and it will fail. From the initiator side, you will see the initator prepare to send MM#5 which will authenticate itself to the peer and it will clearly fail and start retransmitting until it times out. If it fails at this point, it's extremely likely there is a key mismatch in the crypto isakmp key <key> address <peer-address> configuration. This command had to exist in the configuration in order to get past the initial MM#1 and MM#2 messages but since MM#5 and MM#6 is where both the peers use that key to authenticate to each other, that's where a mismatched key would fail. Now we're going to jump into Phase 2 troubleshooting. On the responder side, we can see a bit more detail. In this example, I changed the responder transform-set to esp-3des instead of esp-aes like the peer is configured to use and I'm using debug crypto ipsec to generate the following output. Much better, right? This data is gleamed from the responder and unfortunately won't show in the debug of the initiator but as stated above, you can easily flip the script on who the initiator is when troubleshooting site-to-site IPSec VPN. As you can see able, the peer address is not found in the crypto map on the responder and it is rejected. With that, I'm going to go ahead and wrap up this blog post!